Digital signage screens are a great marketing and advertising tool for your business or organisation. But in order to keep your customers watching, you’ll need to ensure your DOOH strategy adds value to them too. In other words, you need to give them something in return – for example, by providing them with content that is both informative and entertaining, also known as infotainment. A common place to see infotainment is in a doctor’s or dentist’s waiting room, where there is a captive audience. Wherever people have to sit and wait, they’ll be glad of something to watch to pass the time and relieve the boredom. People in these areas also have a common interest: health. Infotainment content here could include interesting health facts or tips, and to serve the goals of the business, they could be interspersed with adverts for products/services and even promotional social media content. However, you won’t just find infotainment at the doctor’s. Infotainment is becoming an increasingly popular digital signage strategy and is and making its way into transportation hubs, elevators, sports bars and even taxis. For example, the famous black cabs in London, UK are frequently fitted with their own DOOH screens. This provides the passengers with information about restaurants, cinemas, theatres and live music venues while they’re on their journey. DOOH campaigns on other modes of transport are also very popular, with boats and ferries being prime locations, often including weather-related information. The key to the success of infotainment is the quality of your content and the capacity to frequently update your screens with new, timely information and entertainment. 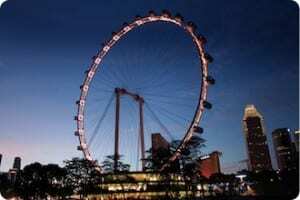 By using digital signage solution like Signbox, you are able to stream real-time content like weather updates and news, while popular tourist attraction the Singapore Flyer uses Signbox to deliver information to patrons based on the cabin altitude (read the case study here). The nature of your business and the location of the screens will influence the direction your DOOH strategy takes. One thing’s for sure though: your customers will enjoy the infotainment and your business will benefit from it too!